Welcome to my new column. Although I happen to be drunk right now, I will not be talking about liquor or drinking here. Rather, I will be talking about movies (and aspects of movies) that make me indescribably happy, perhaps unreasonably so. 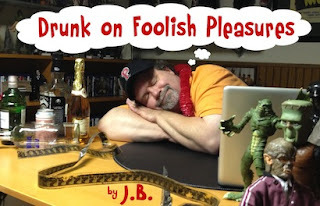 The “foolish pleasures” I describe over the next 52 weeks are intensely personal, and often indefensible, but I hope they spark in you, Gentle Reader, similar feelings about what you love, what makes you happy, and what you hold dear. I promise you an interesting year. 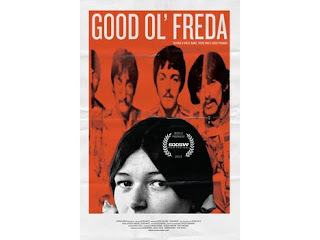 I saw the new documentary Good Ol’ Freda with the best possible audience: thousands of Beatles fans at an annual fan convention last month. Many of the people in the audience had actually helped finance the film through Kickstarter. It was something. Good Ol’ Freda made me indescribably happy. 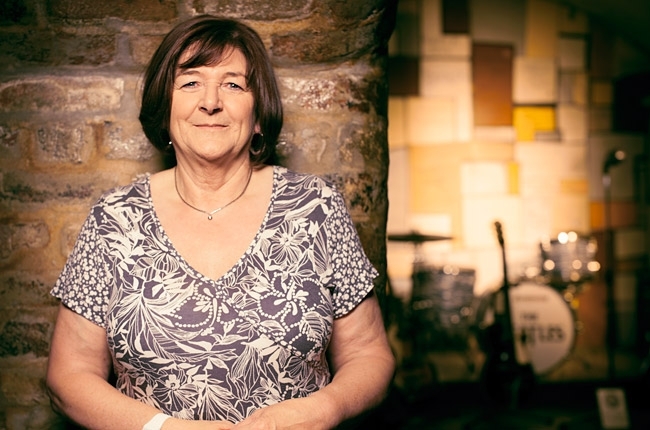 Freda Kelly was one of the teenage girls screaming for The Beatles at the Cavern Club in Liverpool at the very beginning of their rise to fame. Her day job was as a secretary/typist, and as The Beatles’ fame grew, she was hired by Beatles manager Brian Epstein to handle their fan mail and start their official fan club. At this stage, no one knew how immensely popular The Beatles were destined to become. For the next eleven years, Freda was President of their official fan club, overseeing the answering of tens of thousands of letters and attempting to oblige each fan with some sort of personal response. It was a Herculean task. Eventually, (spoiler alert!) The Beatles broke up. The fan club shut down. Freda went back to being a regular secretary, a job she still holds to this day. She had always been a private person, reluctant to talk about her past; she remains the only member of The Beatles’ inner circle to refrain from cashing in with some sort of tell-all book. She was very reluctant to even participate in the documentary. After The Beatles broke up, Freda could have made hundreds of thousands of dollars, perhaps even millions, by selling all of the Beatles material in her possession. She gave it all away, for free, to their fans. We dug it the most, baby. I worried that my reaction to the film was grossly Beatle-centric. Luckily, friends of the site Paul Stone and Emma Eisenhard were there too. We shared a delightful dinner after the screening, and I asked them if I were just blinded by my Beatle-love, or if we had just seen something special. Turns out, they felt it too. Good Ol’ Freda is a very special documentary about human qualities that do not seem to warrant documenting much anymore: loyalty, trustworthiness, and altruism. What makes the film special? One word: Freda. As the film explores her life, we witness just how kind, caring, and giving another person can be. We experience a ninety-minute tutorial on our better selves. As the film goes along, we quickly intuit that while the Fab Four connection may help “sell” the film, Good Ol’ Freda has very little to do with the Beatles at all. It is the story of one extraordinary person placed in very extraordinary circumstances. Here’s one example of what makes Freda Kelly so special: When the fan club officially broke up, she took home all of the remaining unanswered fan mail. Some nights she would answer many letters, other nights only a few, or none. It took her the better part of four years to finish, but she personally answered all of those letters. Every single one. And don’t get me started on her attic! (Too late.) The filmmakers persuaded Freda to go up into her attic, where they filmed her going through box after box of mementos from her extraordinary eleven years with The Beatles. Box after box had audience members exclaiming, “Oh God!” and “Look!” and “Can you believe it?” Priceless bits of memorabilia -- her personal collection -- and none of it for sale. I can see certain rabid collectors watching this scene and salivating at Freda’s treasures. After the film is officially released, Freda may want to invest in a home security system. The documentary features four Beatles songs on the soundtrack, plus snippets from their Christmas albums. Apple is not known to license much of the Beatles song catalog for films; it is a measure of the affection that the surviving Beatles still hold for Freda that they allowed this film to use these songs...for free. Freda Kelly is a very private person. After a screening of the film at the SXSW Film Festival, her own daughter told the director that 75% of the film was information about her mother that she never knew. Often, when Freda is interviewed in the documentary, she will refuse to answer a question, explaining, “that’s private.” In our TMZ culture, that is so unusual, and I love Freda Kelly for it. When fans wrote asking for autographs, it was up to Freda to procure them. In the documentary, she recounts that whenever the four Beatles met at Brian Epstein’s office, she would always be there with a pile of things for them to sign during their meeting. Freda was always sweet, but firm, and the boys would always oblige. Once a fan sent in a pillowcase, requesting that Ringo sleep on it and then send it back. Freda waited for Ringo to spend a night at home, then asked his mum to make sure he slept on that pillowcase and autograph it. Incredible. After the screening, I kept thinking of that line from Shakespeare (or is it Willy Wonka? ): “So shines a good deed in a weary world.” This film is full of good deeds performed by a very good person. Freda Kelly’s life embodies the sentiment of the Beatles’ final song, “And in the end, the love you take is equal to the love you make.” It lifted my heart to see this film. After the screening, the filmmakers, with the real Freda Kelly, took the stage for a Q&A. One woman in the crowd stood to announce that she had been coming to the Fest for Beatles Fans for 34 years, and that this screening was the single best event she had ever witnessed at the convention. This is a very special film about a very special lady, and I urge you to see it. Limited theatrical play dates and ITunes/On-Demand availability begin THIS FRIDAY! And it's GREAT to have you back, sir. Wow, JB, just reading this stirred up the beginnings of an "exploding heart" moment (love and kindness are two of the things that "get" me most) - both your joy experiencing the movie and the lady herself - this really sounds great. For the first time ever I am going to participate in the Atlantic Film Festival - after reading your article, I jumped on the festival web site and was thrilled to see Good Ol' Freda is playing next Saturday, at my neighbourhood theatre no less, so I've pre-ordered my tickets. I'm also watching Blackfish earlier that day, so this should serve as a nice pick-me-up - can't wait! Love the new column JB - great idea! I've got a whole mess of Beatles fans who need to hear about this. Thanks JB. Hello JB I am truly sorry about the predicament we stumbled upon friday. You know the rules and so do I. I will give my full commitment to these rules, you wouldn't get this from any other guy. I just want to tell you how I feel JB, I've got to make you understand. I will never give your identity up, I will never let you down. And my intention is not to make you cry. Well I've got to say goodbye. PS-Thank you for mentioning me today it truly made my day. Watched this over the weekend at the AFF in a nicely full theatre and it really was a treat. Though the audience I was in wasn't nearly as large as yours the experience was much the same - everyone was obviously enjoying it a great deal - lots of laughter and I'm pretty sure I wasn't the only one watching it with a big dopey grin on my face the whole time. Her story was interesting enough in itself - the Beatles-related anecdotes (which tended towards cute and personal rather than sordid) were just icing on the cake. Really loved it and I'm grateful for the recommendation as it was well worth the "theatre experience". It was especially nice coming on the heels of Blackfish which I watched earlier in the day, mostly either on the verge of tears or feeling MAD AS HELL. I would recommend it though - it's simplistic but powerful. And I beg anyone that might read this to never give a dollar to another killer whale marine park - I understand Blackfish is a one-sided look at the industry, but regardless of any possible validity to Sea World's counterpoints to this movie, it only takes a couple objective moments to know that keeping these animals (in particular) in captivity is just plain wrong.